There’s nothing like having a large porch on a house. It offers plenty of space for enjoying nice weather. It’s great for when you have tons of company over during those large parties. 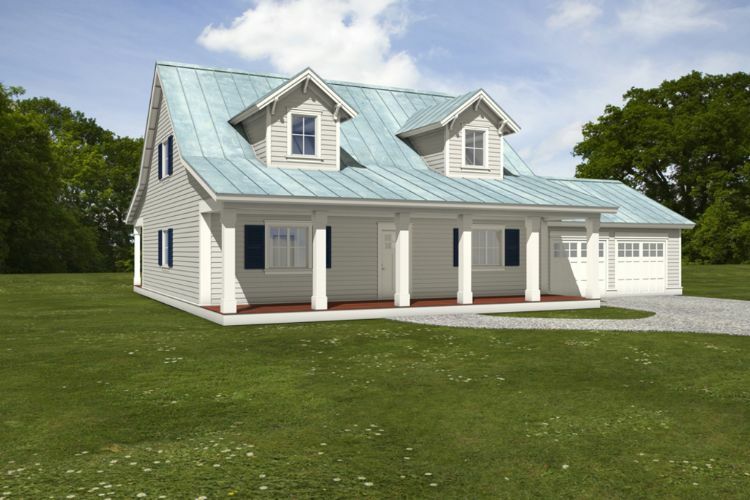 Plus, a large porch has a wider view of the surrounding neighborhood or rural area. 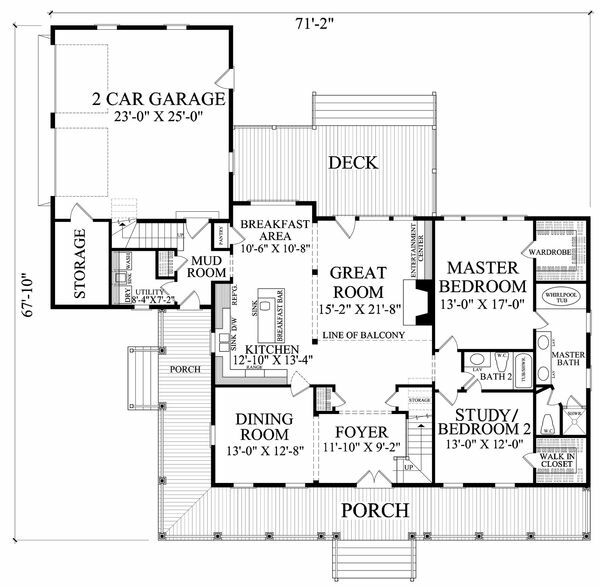 The floor plans below all feature farmhouses that have full-length porches that span at least the front of the main house itself. Some even have porches that wrap around, allowing for more choices in the scenery you view. All the porches are also covered so homeowners and guests can sit out even in the rain. 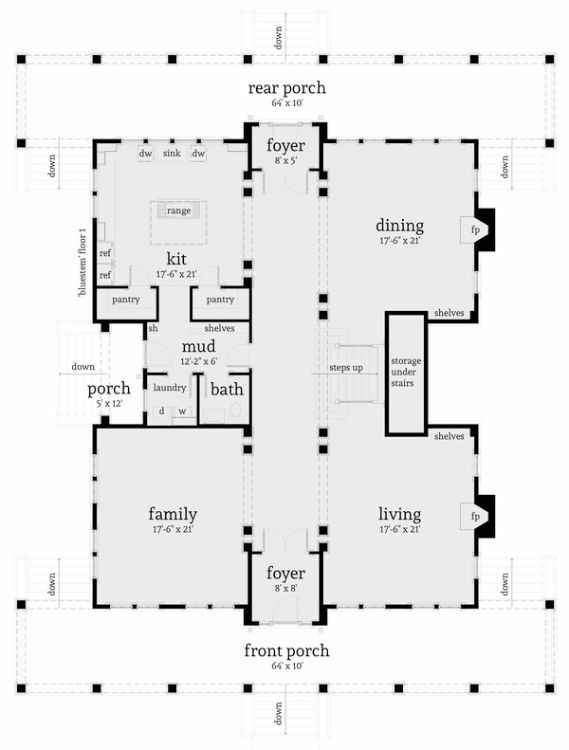 This farmhouse layout is perfect for people who like their spaces separated and contained. Each corner of the house is devoted to its own space in a logical sequence. The dining area sits across from the kitchen, while the family and living areas sit across from each other. 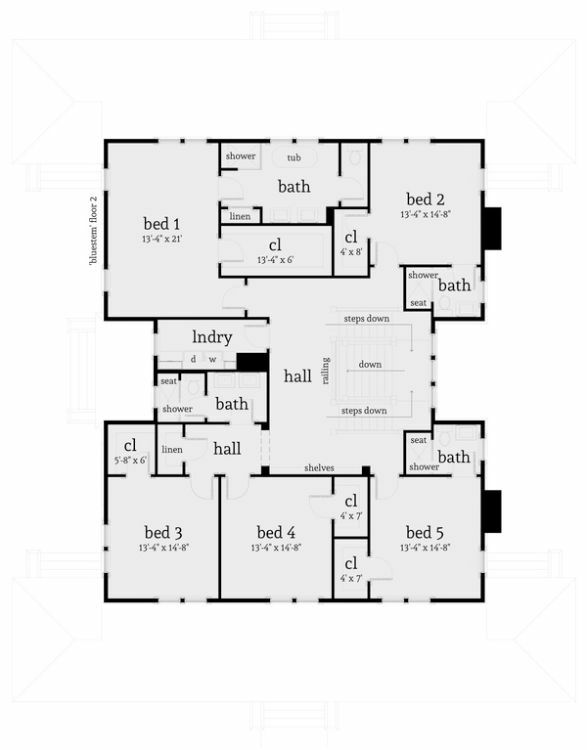 The upper level boasts five bedrooms with four bathrooms. 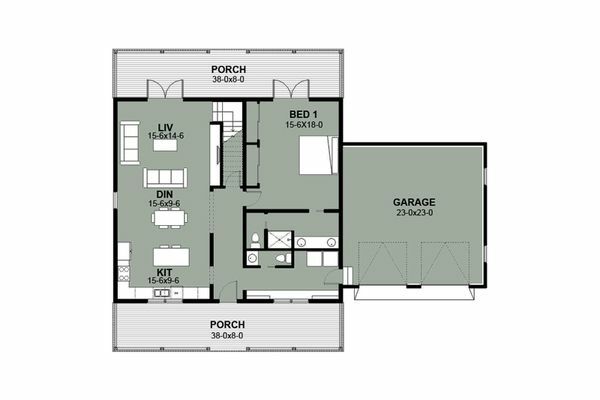 This floor plan has a porch in the front and a deck in the back, perfect for people who enjoy spending time outside. 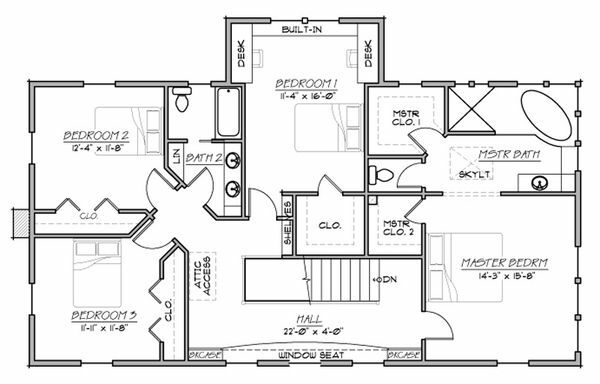 A great room sits conveniently in the middle of the home, while a study/bedroom sits off to the side. 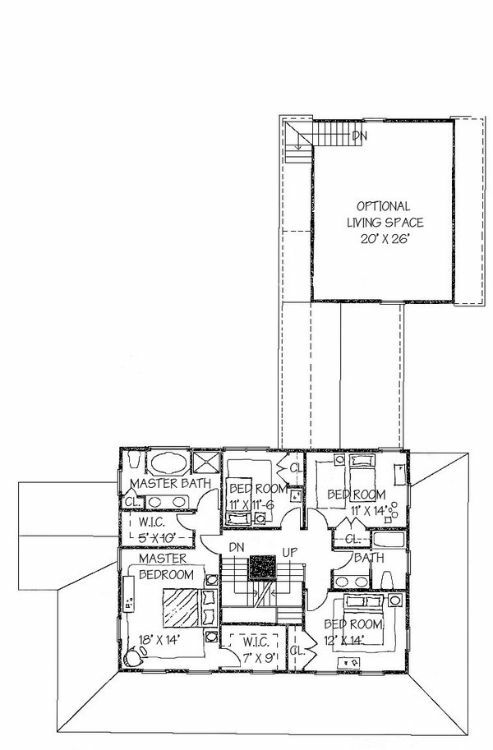 The kitchen, dining room and a breakfast area right off the deck are conveniently spaced from each other. 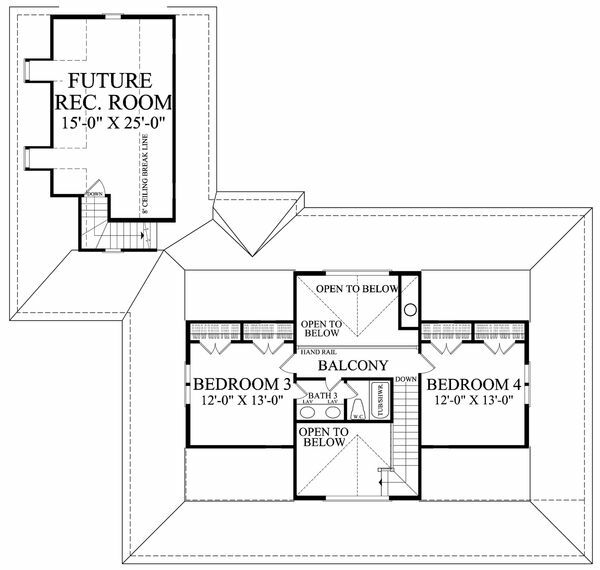 The upper level has more bedrooms still and a rec room. 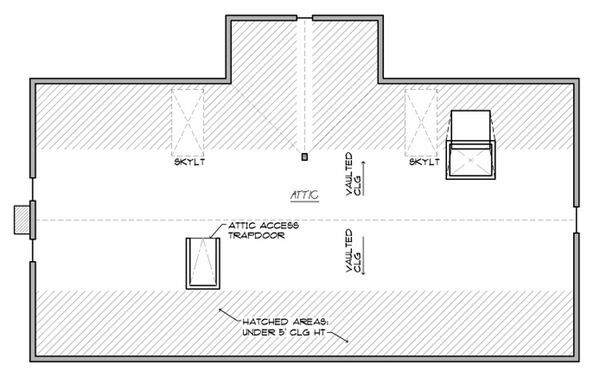 A nice feature of this floor plan is that the dining room sits between the living room and kitchen so there is maximum access to other areas. The open design also helps people socialize. Each bedroom also has its own bath, whether upstairs or downstairs. 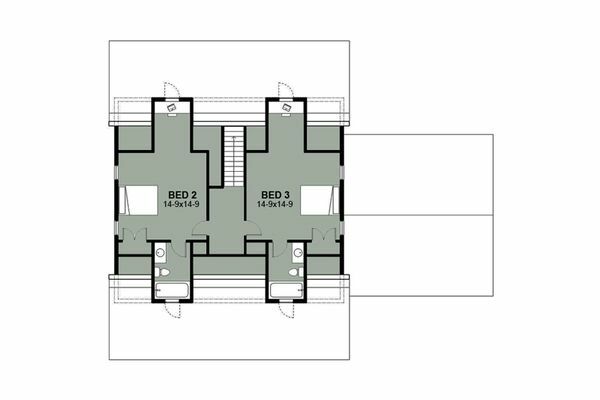 Sitting at 1616 square feet (about 150 square meters), this little farmhouse with two bedrooms is perfect for a smaller family. The living area is big enough to contain a dining area, which is great for entertaining. 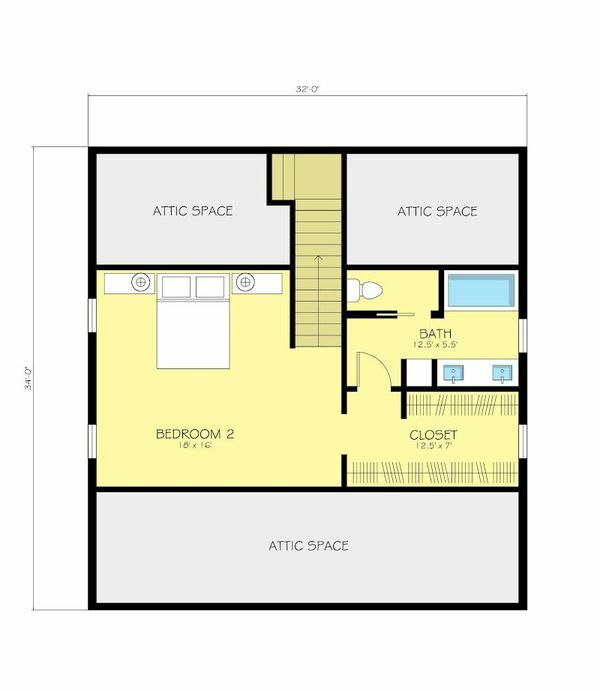 A study is tucked into a corner of the main floor plan, and the second bedroom only shares the top floor with a personal bath, a walk-in closet and some attic space. 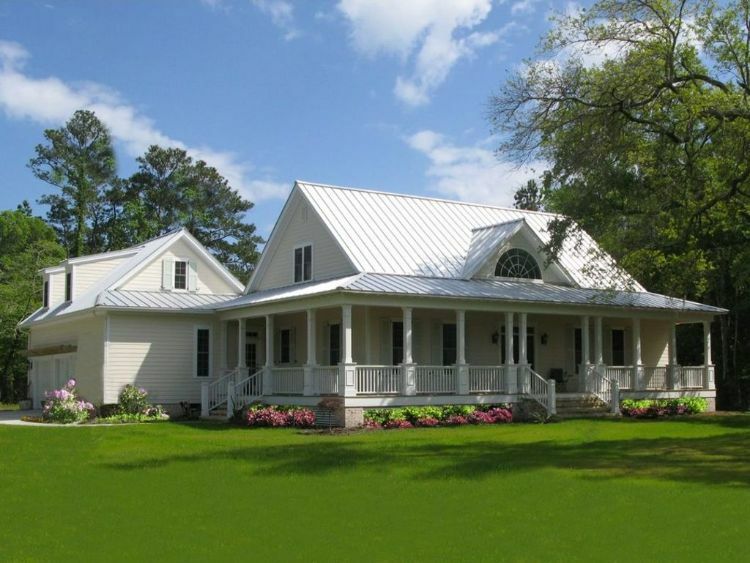 This farmhouse has a lot going on in it, including five bedrooms and three bathrooms. 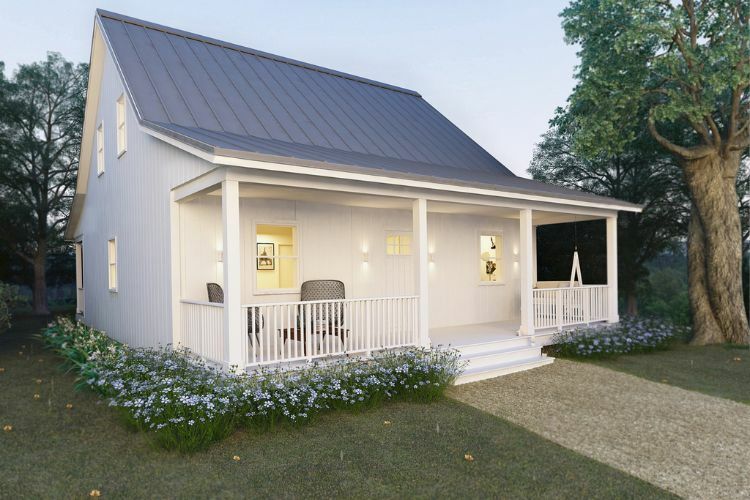 A generous wooden deck and wraparound porch make this a great home for people who like to spend time outside. 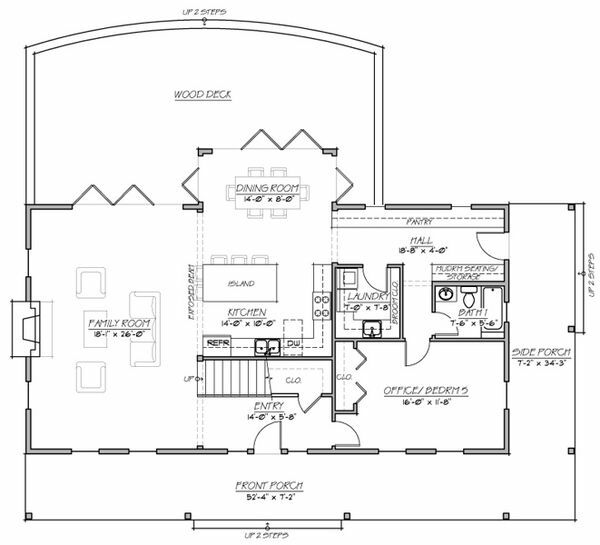 The kitchen’s open design leading to an island and dining area is great for entertaining. 6. 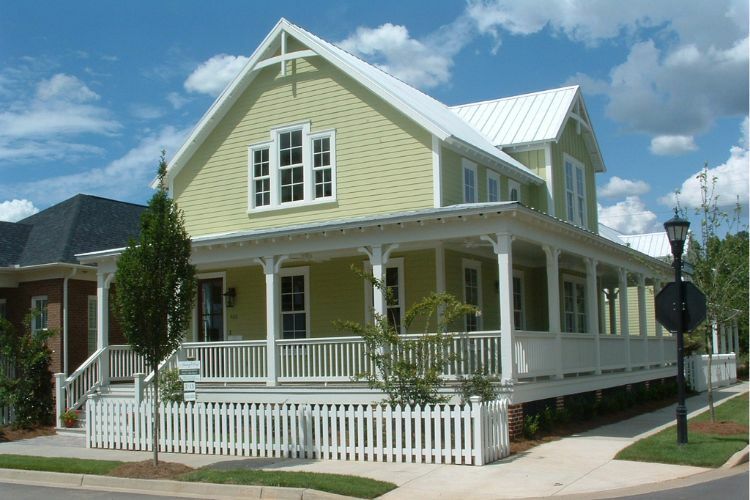 Yellow Farmhouse by Allison Ramsey Architects, Inc. 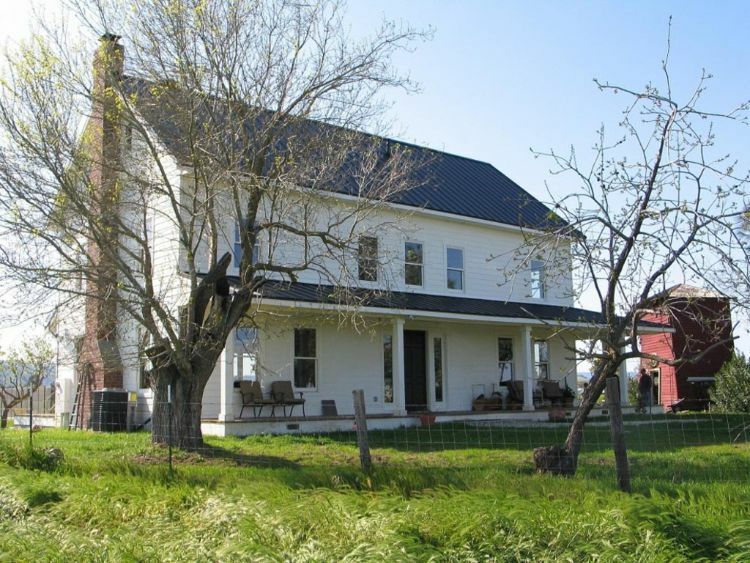 This three bedroom and two and a half bath farmhouse is notable for its expansive wraparound porch. Its open kitchen design leads right into the dining area, but the living area is separated so cooking doesn’t disrupt people in that area. 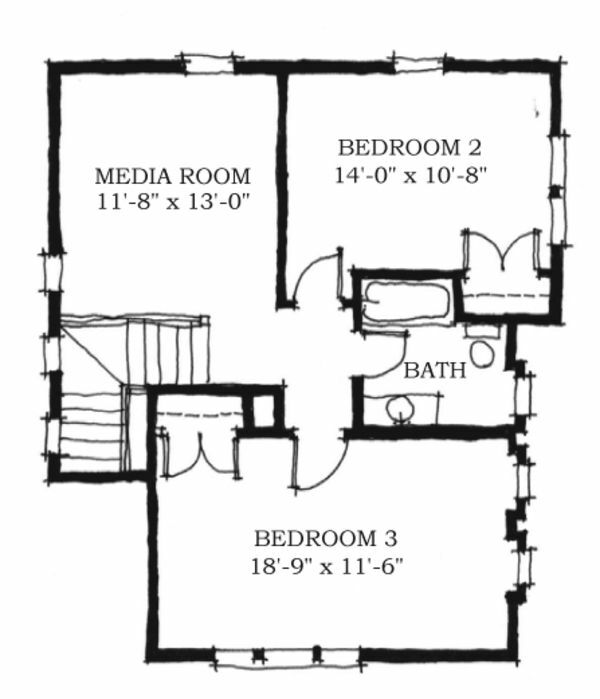 This floor plan also makes space for a media room on the top floor. 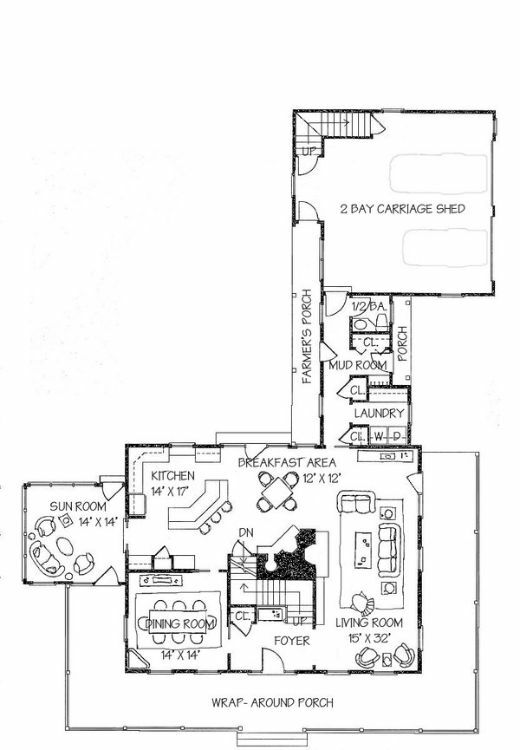 This floor plan is interesting in that it has a two-bay carriage shed separated from everything else by a long passageway, with optional living space above the shed. 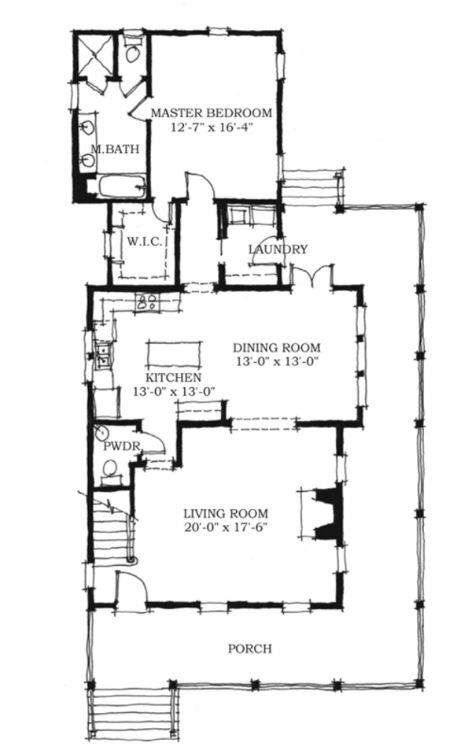 The lower level has a fairly seamless floor plan, as the kitchen leads into the breakfast area, which leads into the living room, all around in a circle pattern. 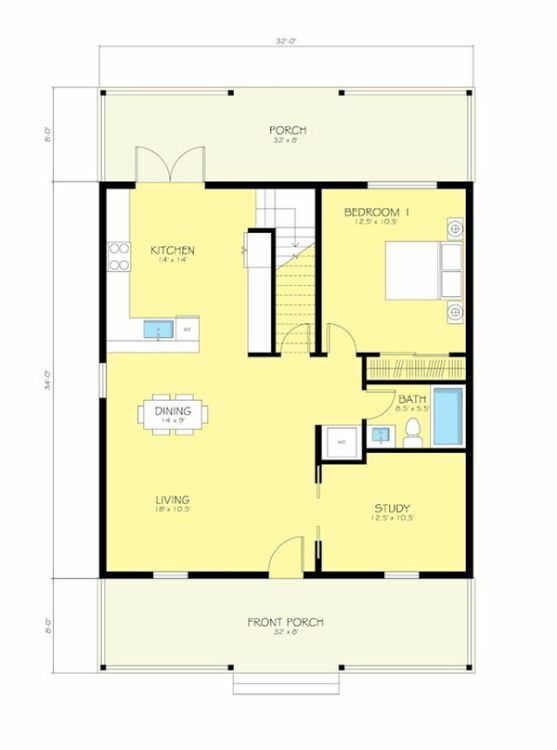 The upper floor is devoted to four bedrooms with two baths. 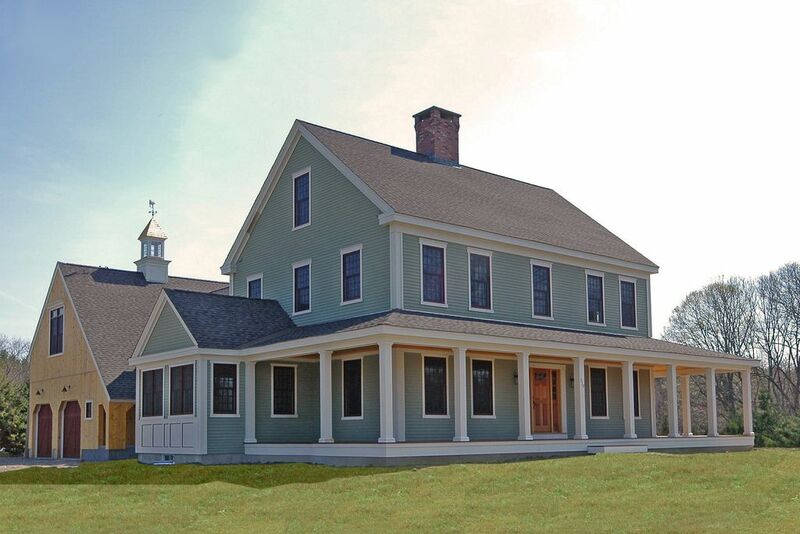 Like these full-length porch farmhouses? Feel free to share on Facebook!